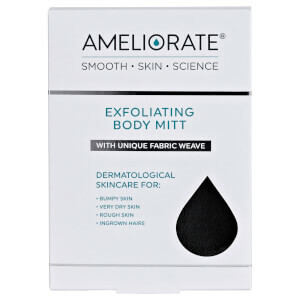 AMELIORATE Transforming Body Lotion is a UK first! A lightweight, everyday body lotion designed for Keratosis Pilaris that both exfoliates and moisturises. It smooths away bumps, softens and protects skin and intensely moisturises for 12+ hours. Active ingredients include Alpha Hydroxy Therapy, Sweet Almond Oil and our unique LaH6 Skin Hydration Complex. Optimum levels of Lactic Acid, a naturally occurring Alpha Hydroxy Acid, exfoliate and renew skin cells whilst drawing moisture into the skin. Hydrating Sweet Almond Oil softens and protects the skin, enhancing its natural moisture barrier. Clinically proven and dermatologist tested, AMELIORATE is designed for rough, dry and bumpy skin. It makes Keratosis Pilaris look and feel better, deeply hydrates very dry skin and leaves normal skin amazingly soft and smooth. Aqua/Water/Eau, Ammonium Lactate*, C12-15 Alkyl Benzoate, Glycerin, Prunus Amygdalus Dulcis (Sweet Almond) Oil, Ethylhexyl Palmitate, Cetearyl Alcohol, Glyceryl Stearate, PEG-100 Stearate, Dimethicone, Hydroxyethylcellulose, Phenoxyethanol, Cetearyl Glucoside, Xanthan Gum, Sodium Benzoate, Sodium Stearoyl Glutamate, Tocopheryl Acetate, Fragrance (Parfum), Potassium Sorbate, Pentylene Glycol, Hydrolyzed Milk Protein, Disodium EDTA, Lactic Acid, Serine, Sodium Lactate, Sorbitol, Urea, Linalool, Citronellol, Sodium Chloride, Citrus Aurantium Dulcis (Orange) Oil, Limonene, Coumarin, Juniperus Mexicana (Cedarwood) Oil, Alpha-Isomethyl Ionone, Allantoin, Pelargonium Graveolens (Geranium) Oil, Geraniol. *From Lactic Acid.